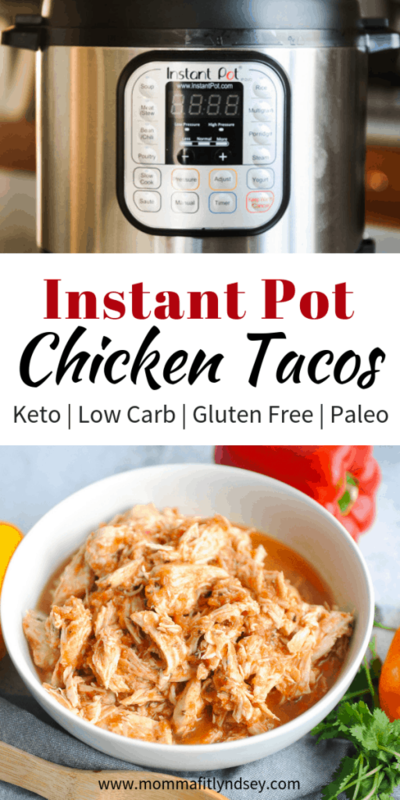 These instant pot chicken tacos are a healthy weeknight recipe that is keto-friendly, gluten free, paleo and whole30 compliant. Seriously, could there be anything better? Yes – they are also SIMPLE! I love simple weeknight recipes that are healthy and filling. 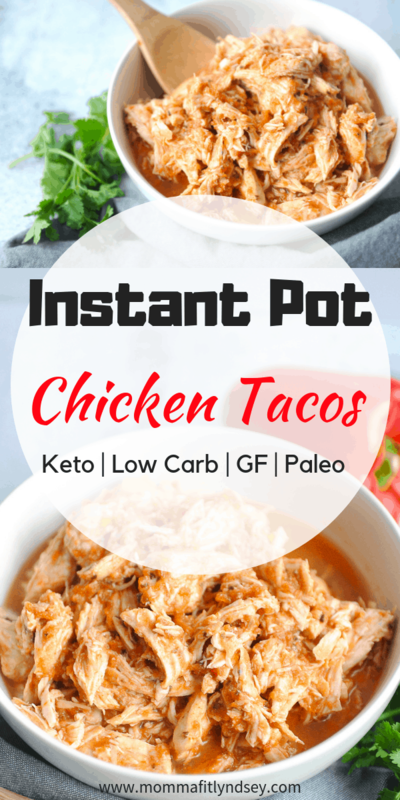 The instant pot is one of my favorite tools to make healthy eating simpler. 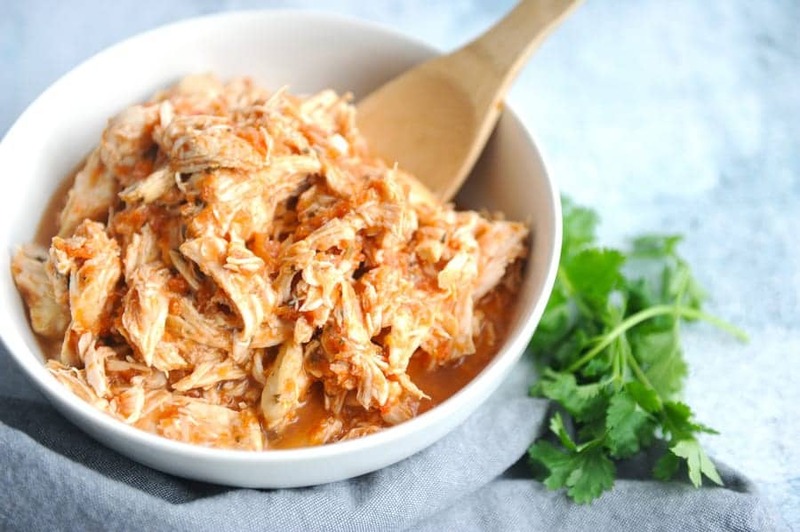 You can also make this recipe in the slow cooker! 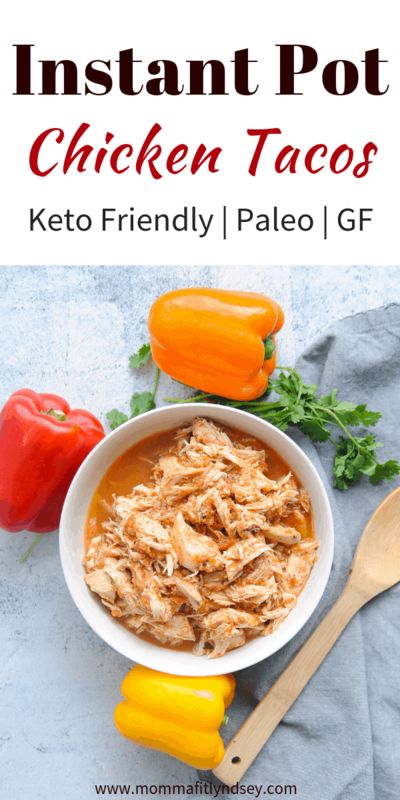 Trim chicken of excess fat. Place into Instant Pot. Add garlic, salt and salsa. Carefully seal Instant Pot and follow all safety directions. Turn pressure release valve to sealing. 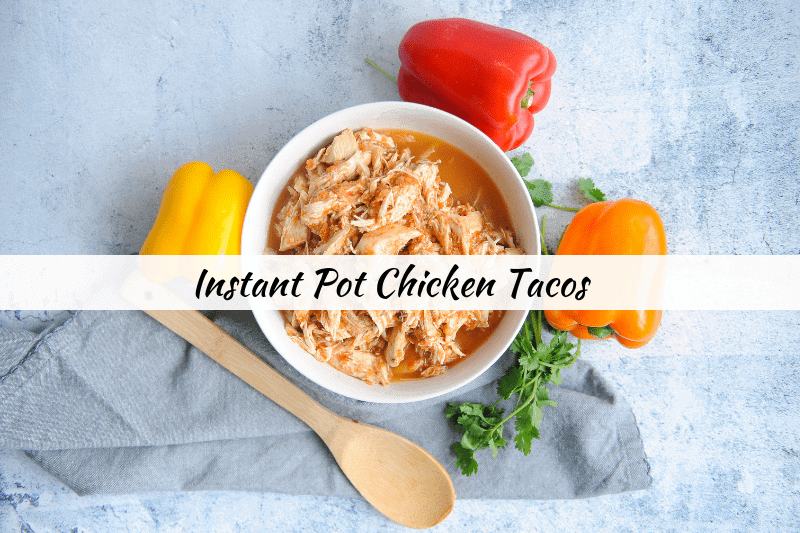 For frozen chicken - turn instant pot on for 11 minutes using the poultry setting. 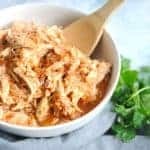 For fresh chicken - turn instant pot on for 7 minutes using the poultry setting. Note the size of your chicken will impact cook time. 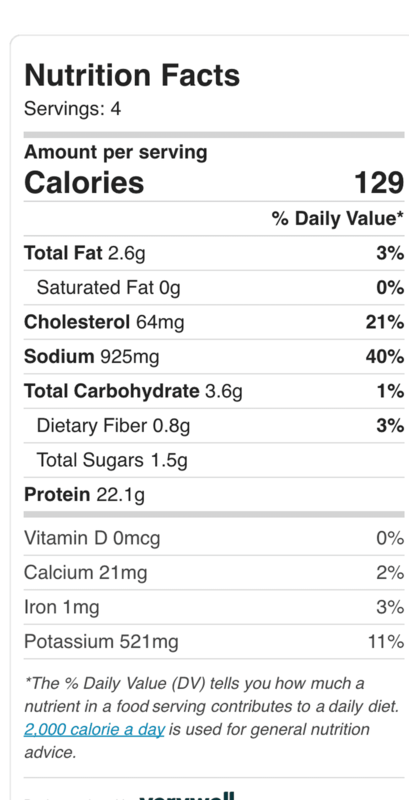 If you are using smaller or larger chicken breasts, adjust accordingly. Once completed, let the pressure release naturally for 5 minutes. Then release pressure by turning the from sealing. Let the chicken sit for 5 minutes before shredding. Chicken may also be stored in the refrigerator overnight and shredded the next day. This will help to maintain moisture. 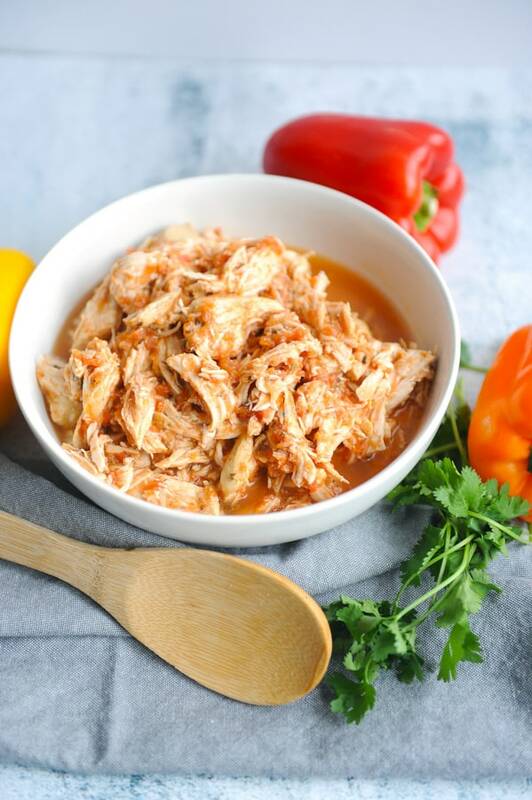 If making in the slow cooker - follow all directions (except for Instant Pot directions) and cook for 6-7 hours on low or until cooked through and easily shredded. 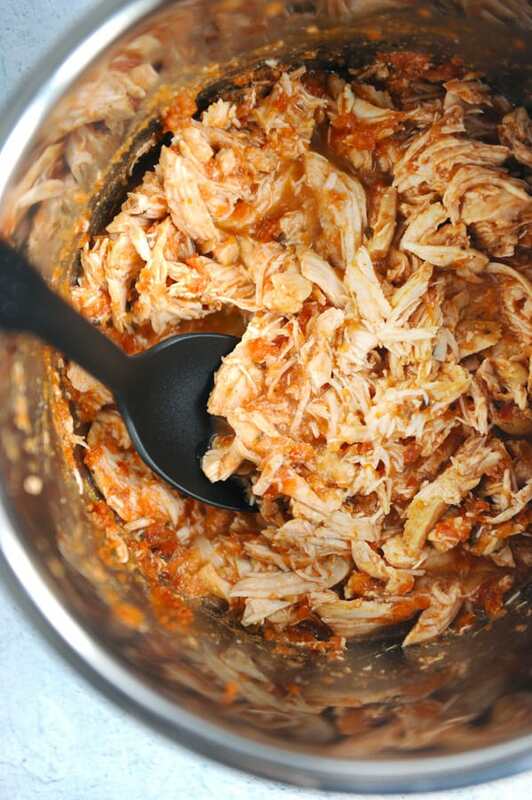 This chicken taco meat is so versatile. Our favorite way is to serve it as a chicken taco bowl. I put a little bit of cheese, extra salsa, avocado and some greek yogurt on top. 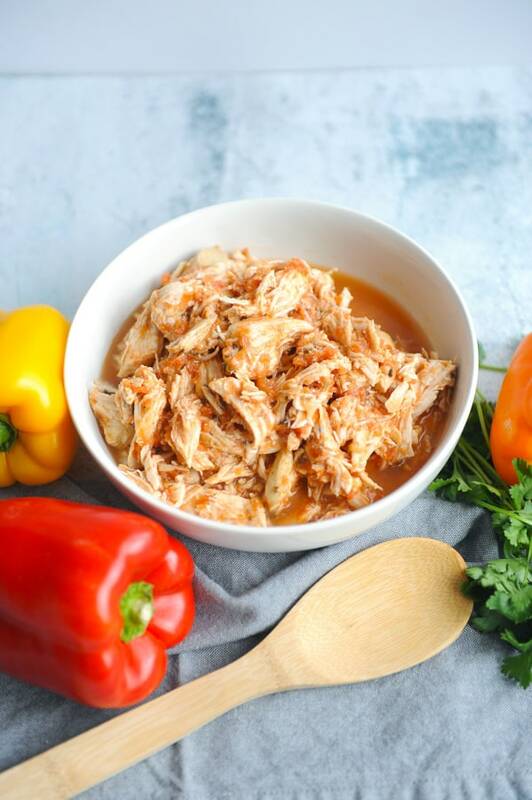 Did you know that you can cook instant pot chicken breast straight from the freezer? My mind was completely blown when I found out! How many times have you had to totally change your dinner plans because your chicken was still frozen??? Here is an important thing to note – when you put frozen chicken into the instant pot, BE SURE to have the chicken breasts separated from each other. If the chicken breasts are stuck together, they will not cook on the inside. This will result in you having to cook the chicken longer which can lead to dry and rubbery chicken – not good! When I am freezing my chicken I like to wrap the chicken breasts individually for this specific reason! Join over 30,000 other followers and subscribers in getting more healthy family tips on a budget right to your inbox! 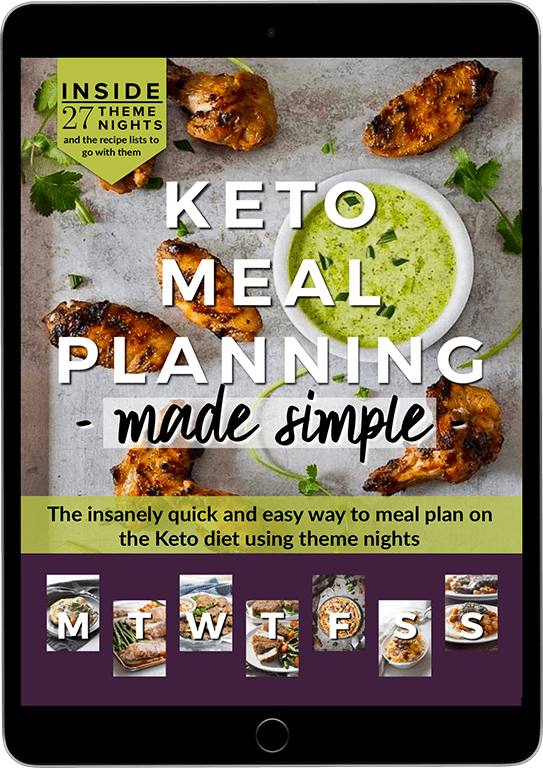 Download your Weekly Meal Planner below!